Florida-based pianist and composer Elizabeth A. Baker brings a solo concert of modern works spanning a dynamic range of styles and emotional content. Blending acoustic piano with electronics, the recital features music of Philip Glass, Arvo Pärt, and the rarely-played Visionary Landscapes by Alan Hovhaness, as well as original works composed by Ms. Baker, including the world premiere of her Magnetic Resonance, a surprisingly romantic two-movement composition for MRI-piano duet. 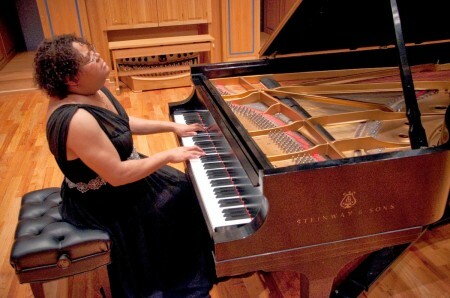 Celebrated for her “terrifying dynamic range,” as well as unique sensitivity and ability to sculpt her performance for the acoustics of a space, Elizabeth A. Baker is a dramatic performer with an honest, near-psychic connection to the music. She is dedicated to promoting new music and has a passion for making rare concert works accessible to the general public. As a composer, her understanding of sonic space pairs with a unique eclectic voice, making for a spatial and auditory experience of music.